Undefeated in the professional game and credited with saving the heavyweight division, you would think Anthony Joshua is a contented man. But the British boxer, who holds three of the sport’s four major world title belts, is not yet satisfied with a life that has already defied the odds. “I’m still tired now and again, I don’t wake up every morning feeling fresh, my bed’s not as comfy as it should be,” the 29-year-old told CNN World Sport’s Alex Thomas. But things not being perfect is just how Joshua likes it; it keeps him hungry. It’s a hunger that’s helped him achieve such success in a relatively short amount of time. Joshua only started taking boxing seriously when he was 18 — a defining moment in his life. “I never knew I wanted to be a boxer,” said the Briton, who was a keen footballer and promising sprinter as a child. Joining a local gym helped Joshua take a more regimented approach to life. He started to watch what he ate and was more careful with whom he spent his time. Getting fitter became an addiction that steered him clear of unhealthy temptations and kept him on the right side of the law. “Where I spend most of my time is what I’ll become,” said Joshua, the WBA, WBO and IBF heavyweight champion. Just like his neat footwork and powerful right fist, Joshua’s career has been all about timing. After finding sanctuary in the gym, he began a successful amateur career which reached a pinnacle at the 2012 Olympics Games in London. 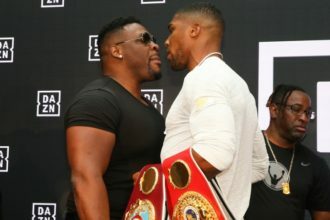 Despite being a relative novice, Joshua won the super-heavyweight gold medal in a city where he had previously been arrested for drug and speeding offenses. The country fell in love with its new sporting hero, and Joshua began the next stage of his meteoric rise. He signed a professional contract in July 2013, winning his debut fight with a first-round knockout. Such emphatic stoppages would become his specialty — Joshua now has 22 consecutive wins. 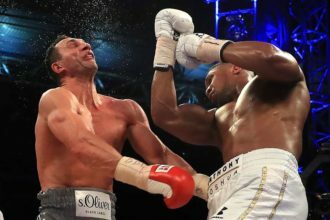 Many have credited the Briton for saving the future of heavyweight boxing and reconnecting the sport with the public. His fight against Wladimir Klitschko in 2017 broke box-office records in the UK, with more than 1.5 million people buying the fight. “I can’t do it alone, I think we’ve added to it,” he admitted. Joshua was born in Watford, north west of London, to Nigerian parents, and the African country has been a strong influence throughout his life. The fighter has a tattoo of Africa etched on his right shoulder, with Nigeria visibly outlined. “I’m the first generation here — the connection is still thick,” he said. Despite this, he concedes his parents initially “frowned” at his decision to pursue a career in boxing, wanting a more traditional route for their son. He has developed an understanding of different cultures and an acceptance of people coming to the country for a better life. “Whether you call them ex-pats or call them immigrants, it’s all just in the search of work and for a better life so I really just respect anyone who is trying to do that for their family,” he said. After his boxing career is over, Joshua is keen to use his platform to help charities looking to support vulnerable people and is also keen to engage more with politics. Like everyone in Great Britain, Joshua is keeping a watchful eye on Brexit negotiations. He’s hoping for a good deal for the next generation. “Let me get post-career and I’ll deal with all that stuff,” he laughed. Fighting for a better future has become more important since the birth of his son, who is now three. Balancing training with fatherhood has been a predictable challenge but one he’s embraced. “My time isn’t my time anymore. Before I could go home and put my feet up and it was about me, now it’s about my son,” he says. Much like his sporting career, Joshua is determined to be the best father possible. He hopes to teach his son lessons that he learned while growing up in humble surroundings. “I think the goal for me is to help him mature,” he said. Joshua’s next fight will take place at Wembley in April but he is currently without an opponent for the showpiece event. There was speculation he would face either Tyson Fury or Deontay Wilder, but the issue is still unclear after the pair slogged out a stunning draw in Los Angeles Saturday. Either way, Joshua is eager to keep learning and is staying true to the values which made him a champion in the first place. “Even though I’m not training for a fight, I’ll remain training,” he says.